The Yellow Warbler is the first warbler I ever saw, and the most recent. It’s among a handful of species — American Robin, Black-capped Chickadee, the unholy trinity of House Sparrow – Rock Pigeon – European Starling, a few others — that have been everywhere I’ve ever lived. I’ve seen Yellow Warblers in the low shrubs of Western New York pastures, the river valleys of Missoula, and the trees of abandoned industrial sites in New York City. They are not shy, not given to skulking in dense underbrush or retreating to the crowns of great trees. And even when you can’t see them, you’re likely to hear that easily mnemoniced song — “Sweet, sweet, sweeter than sweet.” They’ve sung all through the 90+ degree heat that has oppressed Missoula this week, without melting. The standard-issue Yellow Warbler is just that. Oh, they’re darker on top, females and young are a little greener, while males at the peak of their virility show off light orange stripes along their undercarriage. But for the most part the overwhelming impression on seeing a Yellow Warbler is of a brilliant little spark. In North America, that is. As you travel south, everything gets all higgledy-piggledy. The ABA currently lumps the Mangrove Warbler and Golden Warbler with the Yellow Warbler (the IOC lumps Mangrove and Golden Warbler together but splits them from the Yellow Warbler that breeds in North America.) Mangrove Warblers, in particular, turn up in the ABA listing area with some regularity, particularly at the southern tip of Texas, where higgledy-piggledy is the name of the game. And Mangrove Warblers, while possessed of as much yellow as an self-respecting American wood warbler, are more notable for the chestnut red they sport on their head, which may manifest as anything from a tidy little cap to a full hood. I know, of course, that the ABA is a scientific organization, and aesthetic arguments hold little weight with them (otherwise we wouldn’t be stuck with the prosaically-named Yellow-rumped Warbler and Northern Flicker.) But honestly. 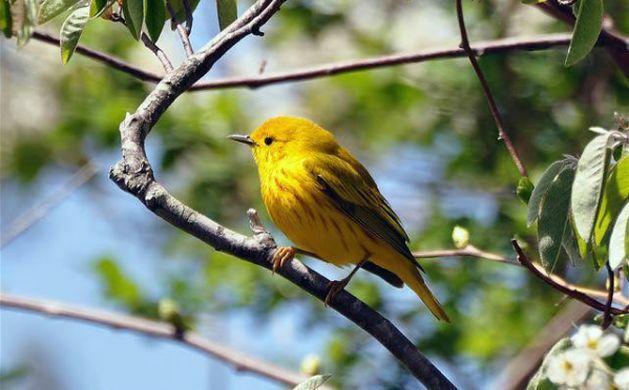 If the Mangrove Warbler qualifies as a Yellow Warbler, then you might as well call the Wilson’s Warbler a Yellow Warbler, or the Prothonotory Warbler. This may seem like some kind of Andy Rooney-ish crotchet, but I honestly think it’s a barrier, however small, to the average non-birder’s ornithological engagement. Chuk makes his quip about the Black-winged Yellow Bird; my friend Molly insists that everything is a duck, a pigeon, or an owl. The fact is, it’s all part and parcel of a long tradition of bad bird naming: Red-bellied Woodpeckers and Ring-necked Ducks, Connecticut Warblers that rarely appear in Connecticut and Baltimore Orioles that have nothing in particular to to with the city of Baltimore, and of course the endless procession of birds named for the friends and family of a small cadre of long-dead ornithologists, now shorn of significance except to the most historically literate twitchers. Philosophically, arbitrary names divorce average people from nature, creating the same effect as any system of jargon — keeping insiders in and outsiders out. I’m not ready to get metaphysical and suggest re-working our entire North American list in favor of common names for common people, allowing intuition to take over from genetic analysis. We never would have gotten all those extra species of Red Crossbill that way. But given how nebulous the idea of a species can be, I think there’s something to be said for taking aesthetics and ease of access into account in these borderline cases. Let the Yellow Warbler be a yellow warbler of the sunny summer, and give the Mangrove Warbler its head. Carrie, you’re confusing the ABA with the AOU. And what’s wrong with being “historically literate” in any event? Knowing a little bit about where an apparently “bad” name comes from usually proves that it’s not so bad at all — and in any event makes birding that much more enjoyable for some of us. As to your notion of the “arbitrary name,” well, words are arbitrary signs, and names are the arbitrariest of words. Just the way it is. There’s lots of room for better, more appropriate naming. I’m on a one-man-campaign for dropping the Wild from Wild Turkey; I mean of course they’re wild. If wild makes any kind of sense then perhaps we should go to Wild Red-bellied Woodpecker, Wild Veery or Wild long-tailed Duck. Right on, Peter. “Northern Turkey” would do just fine. Or we could keep the term “Wild” but change “Turkey” to “Gobbler.” Wild Gobbler would be a bird that people would really want to see! Wild Veery sounds like a gunfighter from the Old West. Also, the mention of WIlson’s Warblers being yellow warblers (lower case Y and W) reminds me of an incident I was involved at Metzger Marsh in Ohio. Looking through a scope I told my wife I was seeing nothing but black rails. Unfortunately other birders were within earshot and apparently didn’t hear that I said “black rails”, not “Black Rails”. They were very disappointed with the American Coots. Years later, Sarah and I still use “black rail” to call out a coot, but we check to make sure we’re alone first. Where Are You Birding This First Weekend of July 2013?